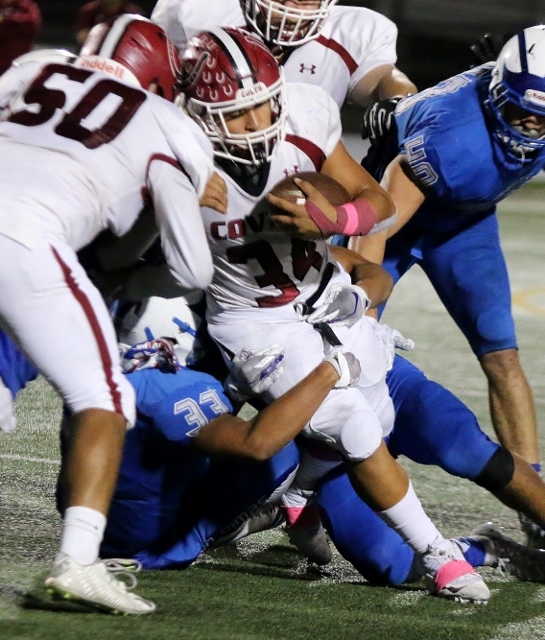 (San Dimas) – Austin Rivera scored six touchdowns and San Dimas passed the 60 mark late in the fourth quarter in a 63-34 rout of visiting Covina Thursday night in Valle Vista League action. The Saints blew it open in the beginning of the third quarter scoring two touchdowns in a minute and 18 seconds. Leading 35-27 at the half San Dimas needed just three plays to go 75 yards. a 71-yard run by Matt Sloan set up a two-yard touchdown run by Rivera to make it 42-27. On the next possession Covina’s Nin Burns II couldn’t handle a bad snap that sailed past him and was recovered by Billy Hennessy in the end zone. Only 1:18 had ticked off the clock in the third and the Saints had scored 14 points to lead 49-27. The Colts could never recover. They only managed one more score the rest of the night on a 21-yard touchdown pass from Burns to Rudy Suarez in the fourth quarter to cut the lead to 56-34. Rivera, who scored on a one-yard plunge early in the fourth, added a four-yard TD run with 1:23 left in the contest for his sixth of the night. Rivera’s longest run from scrimmage was 11 yards but he made them count. He had 113 yards on 25 carries. His final score of the night capped an 18-play drive that burned up almost seven minutes and vaulted the Saints past 60. 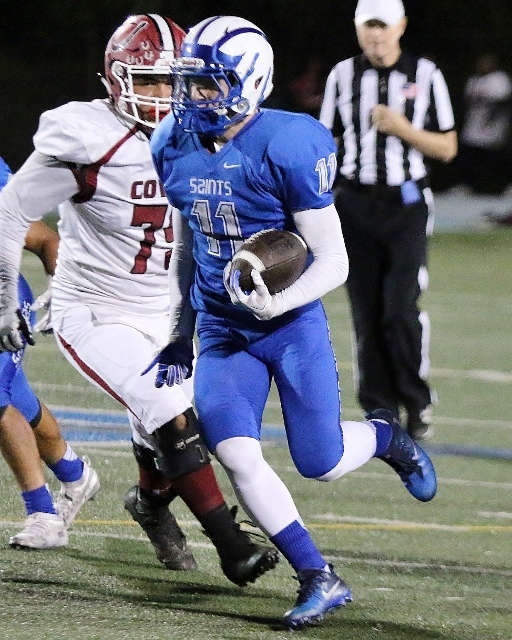 The Saints went up 14-0 in the first quarter when Rivera finished a 10-play drive with a one-yard run and after a Covina fumble left the Saints on a short field, Nick Cuda scored on a 19- yard run. Erik Cuellar got loose for a 53-yard touchdown scamper later in the first but the Saints went up 28-7 early in the second on a 65-yard touchdown pass from Dylan O’Leary to Nick Sloan and an 11-yard jaunt by who else? Rivera. The Saints were still up 35-20 after another Rivera short yardage touchdown run and a 13-yard scoring strike from Burns to Matthew Wells for Covina. It appeared the Saints would take that two score lead into the half. But with no time left on the clock Burns threw a hail Mary into the end zone that Suarez came down with for a 46-yard touchdown. The Colts were down by just eight at the break and had gained some momentum but that all changed in the first 78 seconds of the third quarter. Burns ran for 63 yards and threw for 174 yards and three touchdowns for the Colts. Cuellar had 118 yards and two scores on 17 carries. 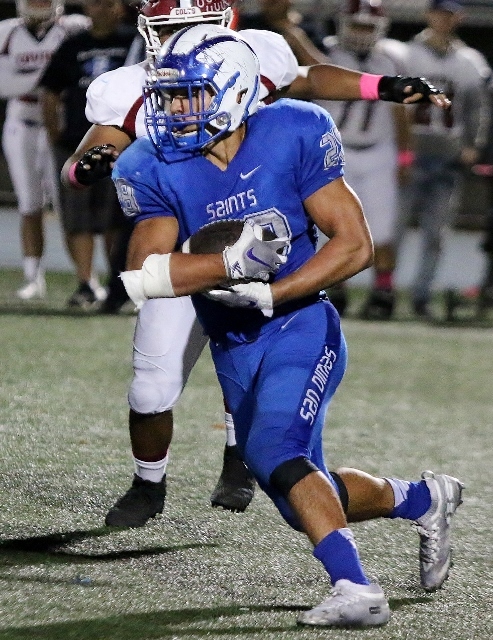 For San Dimas Cuda rushed for 123 yards and a touchdown on 14 carries as the Saints racked up 380 yards on the ground overall. O’Leary threw for 121 yards and a touchdown. With the victory San Dimas improved to 6-1 overall and 2-1 in the Valle Vista. Covina dropped to 4-3 and 1-1. 29 Comments to "It’s Sixties Night in San Dimas"
1st I’m not a Covina homer. I’m just starting facts that you seem to overlook. Real Teams ? Why did NV drop Charter Oak? Why won’t SD ever schedule CO ? If there that good call Damien, St Frances, La Mirada or even Amat. Playing Whittier and Don Lugo is not real football. Try again !!! The reason I have picked Northview to win a D7 title is their defense. Perez will sub in early for his defensive guys but when he needs a stop they get it. His backers and corners are fast and run stoppers. Add to the fact they can put up points? The math is very easy. The most frustrating but important thing I have learned about KIDS playing a team game is that it only takes 1 of the 11 players on a team to make a mistake which in turn affects the other 10. Mistakes are going to happen as sure as am am going to be groggy in the morning before a cup of coffee. How, or if you correct those mistakes will be reflected on the scoreboard. Look at Baseball… you can play a team 3 straight times. One game you can win 14-0 and the next 2 lose 12-0. It happens. It’s a game. My point is what or what not any coach does is entirely up to that coach. What any other coach or parent, or fan may, or may not do, bears no weight. Example : It’s 3rd and 14. What would you do? Would you run up the middle? I wouldn’t, but then again, I’m not calling the plays. If you want to question why a coach does or did what they did ask the coach. I learned a long time ago that doing so is futile and to just go with the flow. It’s impossible to know what any coach is thinking in their heads. And not knowing that, and criticizing said coach(s) does no one any good. When I leave a game it’s over. The jello is jiggling…and all that. I can, and will, reflect and discuss but alas, at the end of the conversation what I may or may not think bears as much weight as helium. Everyone is entitled to their opinions but not entitled to have everyone agree with it. Covina put 60 on Rowland last week, but now cries foul this week when it happens to them? Congrats to Rowland for not whining about it last week on the blog! Amazing how some on this blog are bitching about the SD running up the score. I don’t have a problem with it. It’s the opposing teams job to stop them from scoring, plain and simple. Anonymous. U are silly. Covina can score in seconds. Look at 1st half. Geez. So how do u feel about coach Logan at centennial? He runs it up every week. Just saying. Covina’s def was more like a JV scout team, so SD wanted to work on a pass play against warm bodies. Big deal, get over it, and start worrying more about stopping NV, which is never going to happen! Your Defense is about to give up more than 100 pts in two weeks, get it coached up and stop worrying about a stupid pass late in the game that had no bearing! Move on! Colt74 your missing the point. it’s not about running up the score, it’s about with the game out of hand and up 56-34 with under 2 mins. Why are you passing? why not put in your 2nd team to give them some playing time? Holman has a History of running up the score and leaving his first team in! You could ask a lot of coaches, and they would agree. Stop with the San Dimas ran up the score nonsense. Just stop. 1. We played so poorly that for a good hour after the game I was searching my memory for a more poorly executed game by us. I drew a blank. 2. If San Dimas went to take a knee and fumbled the ball…it would have rolled into the end zone, they would have recovered, and it would be a TD. That is the Readers Digest Condensed Version of how OUR night went. 3. We fumbled the ball, hiked to our QB like he was back 15 yards to punt…but wasn’t, dropped passes, missed tackles, or realized the ball carrier was 5 yards past us before we could even try to miss a tackle. Pass coverage I am sure will be re-covered in next weeks classes. 4. It was a bad night for us. 5.San Dimas did what it does best. They pounded the ball. And took advantage on passes to holes in our coverage’s. 6.Do what works. When it’s working. 7.Look, I’m a HUGE Covina homer. BUT….I am truthful. And I’ll be there next week and the week after that cheering on our kids. I’m not here bashing our kids but stating facts as seen by “MY” perspective.. Anyone who feels otherwise knows where they can find me to argue otherwise. I look forward to the opportunity of setting them straight. But I know that there is not a person out there who can refute my summary ( with a straight face ). 8.San Dimas whipped our butts. Period. 9.We made plays but if plays were candy and San Dimas was giving a piece of candy to a kid every time they made a play and we were doing the same to another kid each time WE made a play…..the kid getting our candy would have felt gypped. 10. No consistency from us. Our players had heart and desire last night. And I am proud of that. It was not in the cards, and we ended up like a one legged man in a kicking contest. We had a bad game and San Dimas was more than happy to point that out at every opportunity. Good coaches take advantage when offered the chance. They don’t lay down. And if Coach Holman would have I would have felt gypped. Give San Dimas the credit due them. My Colts will circle the wagons, regroup, try to refocus, and move on. And I’ll be there supporting them because real fans are not just a fan when they win. Real fan also are truthful with THEIR observations from THEIR perspective, and give credit to opposing teams when credit is due. The proof is ALWAYS in the scoreboard. You and all the SD Homer’s can bump your gums all you want. You’ll both be 1 and done in the playoffs. Good thing NV is good at wrestling and SD is good at baseball. Outside of those two sports your athletic department is weak…. Years ago SD was up 35-0 and took a knee on the 1 yardline to run out the clock, and Covina coaches and fans were upset, and wanted to fight. Now you’re upset when SD scores? What would you like us to do next year, so we know what the rules are? 63 points allowed? This team was supposed to be better than last year. Man, Colt must be crying under his bed. So is it coaching? Or is it the players? I don’t understand how a potential CIF winning team gives up 63 points to a team they were supposed to beat? What’s going on? This was supposed to be there year, or are they a young team?lol.. I hear that one a lot. Maybe next year is there year, but pretty sure the same thing will happen. Saints, SteveO and Area:I’m just saying, when your up 56-34 late in the 4th and game in hand. Passing the ball??? Why not bring the back ups in for a series? The more points you score the better your playoff seed. Really!!! That has really helped you guys the last 3 years!!! WWWAAAAA!!!!! You got 60 put on you, coach up that D or NV might get 70! Wow! I don’t get either. Up 56-34 late in the 4th Qtr and your passing! That’s Holman for you!!! What a joke. No class. Normally I don’t have much respect for running up the score, but I don’t think this applies. According to the article, SD got the ball with a 22 point lead and about 8:30 left. İn HS ball, that could be time to empty the bench, but it could also blow up in your face. So a long (18 plays! ), clock killing drive is both sensible and respectful. Obviously the game was “over” before they scored. They could have (depending on the down) either taken a knee to run out the clock or to turn it over on downs. But at some point, that almost becomes disrespectful too. To me, it sounds like they played it straight the whole way. You usually don’t get an 18 play drive with a lot of deep passes and trick plays. So let it go. By the standards of late scores in a blowout, this is as mild as it gets. That’s typical San Dimas….They’ll run up the score and say their justified. But when they get punched in the mouth it becomes a pity party on how they were wronged or somebody cheated. Or recruits. It’s ok though. NV is coming to end all at nonsense. SD scored 14 points in 1:18 seconds. Covina is perfectly capable of scoring the same or more with 2 point conversions and utilizing onside kicks. Scoring that last TD is more than prudent considering Covinas propensity for coming back strong! How bout you stop them from punching it in. Kids aren’t just going to lay down. True the score did not indicate how lopsided the game was. Best of luck to the Colts. But they will get better from the experience. Never stop playing fellas! Anon: The more points you score the better your playoff seed. The wider the differential helps in tie breaker scenarios. Lots of teams have scored two TD’s in 1:33. SD scored 14 points in 1:18. Covina is perfectly capable of score that and more with 2 point conversions and onside kicks. I think it was more prudent than anything that you might be insinuating. Yup! Remember all the talk at the beginning of the year. Covina was going to dominate, who’s going to stop them. CIF final team. Blah blah blah. They stink! Where’s there big win? Pathetic! CLASSY as it get huh….